The smallest and lightest laser scanners on the market - Focus3D X Series are ideal tools for indoor and outdoor applications. The fast and accurate laser scanners Focus3D offer everything you might expect from professional 3D laser scanners – with FARO’s established and well-known level of simplicity. FFocus3D X 330 offers extra long range - 330m. The HDR imaging function and high-resolution photographs deliver realistic and true-to-detail scan results with spectacular image quality. All scanner types offer the possibility to perform scanning even in bright sunlight. Remote scanning as well as almost limitless scan data sharing via SCENE Webshare make the laser scanning solution truly mobile. The ultra-portable Focus3D X 130 HDR enables fast, straightforward, and accurate measurements of objects and buildings. It records architectural façades, complex structures, production and supply facilities, accident sites, and large-volume components delivering realistic and true-to-detail scan results. 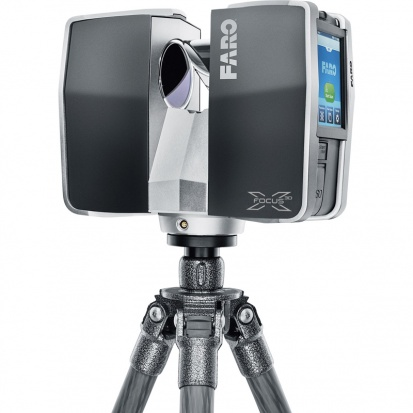 SCENE 3D laser scanner software is specifically designed for the FARO Focus3D Laser Scanner. SCENE processes and manages scanned data efficiently and easily by using automatic object recognition and scan registration and positioning. SCENE can also colourise scans. This point-cloud software for scanners is extremely user-friendly and generates high-quality data in next to no time. Now scanned data can be easily shared worldwide with project partners using FARO's cloud-based hosting solution SCENE WebShare. FARO Focus3D è un laser scanner rivoluzionario senza contatto per la modellazione e documentazione 3D, le cui funzioni sono controllabili in modo semplice attraverso l’intuitivo touchscreen display integrato. Oltre all’interfaccia touch, altre caratteristiche quali le dimensioni compatte e il peso ridotto lo rendono estremamente facile da utilizzare. Grazie a Focus3D è possibile dimezzare il tempo di scansione rispetto ai laser scanner 3D convenzionali.